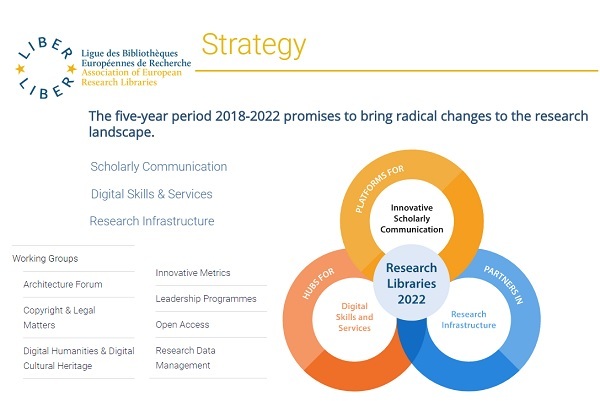 LIBER’s Vision for the research landscape in 2022 is that the role of research libraries will lie in Powering Sustainable Knowledge in the Digital Age. These priorities will be supported by three LIBER Working Groups: Copyright & Legal Matters - - Innovative Metrics - - Open Access. In this frame, LIBER provides its support to four projects: * OpenAIRE 2020, * HuMetricsHSS, * FOSTER Plus, and *The European Open Science Cloud for Research pilot project (EOSCpilot). 7.) Advocating for developing Information Ethics, in the interests of the research community. These priorities will be supported by two LIBER Working Groups: Leadership Programmes - - Digital Humanities & Digital Cultural Heritage. In this frame, LIBER contributes to two projects: * The European Open Science Cloud for Research pilot project (EOSCpilot) and * OpenMinTed. 4.) Scalable infrastructure that should enable cross-disciplinary collaboration. These priorities will be supported by two LIBER Working Groups: Research Data Management - - Architecture Forum. In this frame, LIBER contributes to five projects: * The European Open Science Cloud for Research pilot project (EOSCpilot), * OpenMinTed, * OpenAIRE 2020, * EUDAT, * AARC2. The development of the Strategy has been guided by LIBER’s Mission and Values. Download the Strategy (PDF) or access it online here. LIBER Workshop at IDCC 18 (18-22 February 2018) : How Research Institutions & Libraries can help deliver the European Open Science Cloud - registration is open ! @ Get your free copy of Research Data Management Toolkit !